TODAY COLOMBIA, Camille Boutron, Universidad de los Andes – By now, the numerous hindrances to Colombia’s peace process are well documented, from the inadequate FARC centralisation zones and the tight disarmament and reintegration schedule to a much-criticised amnesty law and the frequent assassinations of Colombian human rights activists. But less attention has been paid to the FARC’s internal challenges as this half-century-old Marxist insurgency decommissions its fighters and transitions into peace. Such dynamics are important. For Colombia’s peace to stick, this violent rebel group must successfully become an officially sanctioned political actor. The FARC now finds itself in the midst of a deep transformation that will alter who it is, how it sees itself and what it does. And while its commanders seem to have a clear political vision for its future, the path there is fraught. As a political party, these consummate political outsiders will have to establish dialogue with other parties and social movements. At the moment, this is difficult to envision. Negotiations with the the FARC faced stiff opposition, and the organisation still features on the US terrorist watchlist. Today, no politician dares to suggest an alliance. But in the long run, such domestic relationship-building seems both necessary and probable. Most likely, the FARC will seek to build ties with Colombia’s leftist national parties and social movements, as it has done in the past. In the 1980s, negotiations with the FARC and other rebels resulted in the Patriotic Union, a big-tent leftist political party. Still, whether the reinvented FARC will be allowed access to the highest spheres of national political power remains questionable. Will Colombia’s political establishment accept these fighters-turned-politicians? In the 1980s and 1990s, more than 3,000 Patriotic Union representatives were assassinated, including presidential candidate Bernardo Jaramillo Ossa. That is hardly ancient history. Will all FARC militants transform along with the organisation? Its leadership seems to have a clear vision of the group’s political future; it will become a political party, name to be determined. But not all members will benefit similarly from this new reality. The FARC is heterogeneous, much more so than most Colombians believe. The relatively high female participation rate (around 40% are women) has attracted the most public attention. But the FARC is also diverse in terms of ethnicity, age, education level and social origins. Some members are college graduates from middle-class homes who have been in the group for decades; others are poor teenagers who joined a few years back. Like Colombian society, the FARC’s fighters are Afro-Colombian, indigenous, white and mixed-race. Its leadership is less so. Like any social group, the FARC’s internal power relations reproduce the social hierarchy of the outside world. From head negotiator Ivan Marquez to FARC top general, Timochenko, the FARC’s highest-ranking, most publicly visible officials are largely white and male. The FARC claims to be a revolutionary movement, in which historical social relations of powers are abolished, or at least reinvented. And it’s true that the group was able to overcome much of the social discrimination that is so deeply institutionalised in Colombian society. But this is only up to a point. FARC women enjoy (some) greater sexual freedoms and reproductive rights, and poor kids get a free education. 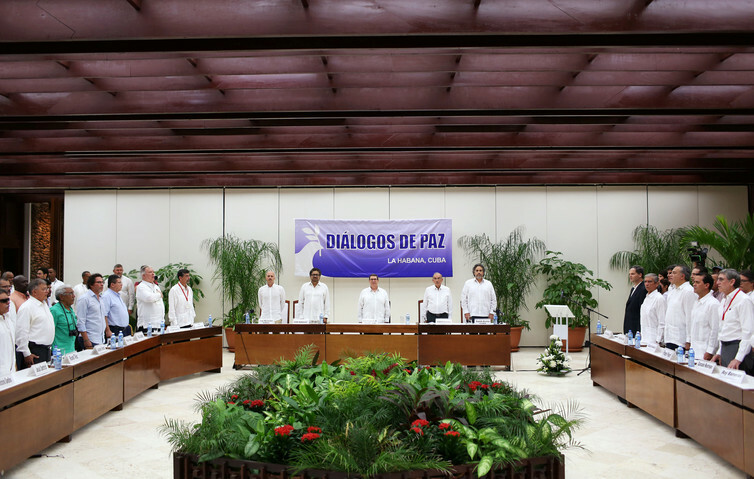 The gender subcommittee of the peace negotiations, established in September 2014 after pressure from women’s groups and international organisations, represented an opportunity for learning and leadership for female FARC fighters. Victoria Sandino, the FARC delegation’s subcommittee chairwoman, stepped out of the shadows to become a prominent figure within the guerrilla group. She is now one of the principal spokespersons of what the FARC is calling “insurgent feminism” – a set of collective anti-patriarchal, anti-racist and anti-classist practices built from the lived experience of female FARC fighters. The experience of negotiation with political actors from different countries and ideologies shows how exchanges might contribute to mutual learning and help guide the deep transformation underway within the guerrilla group. And as a political party, the FARC will likely seek to create new opportunities for political participation of its rank-and-file members belonging to other minority groups as well. Colombia has high rates of social marginalisation based on race, class and gender, and as its solders become civilians, the reintegration process is likely to highlight, and maybe reinforce, inequalities that were less visible when the FARC was a military organisation. Now that the group will not be the sole provider of material support to its members, it is foreseeable that high-ranking former combatants with a diploma and family support will be better able to navigate the postwar period than their less privileged peers. How will the group’s foot soldiers fare in terms of job opportunities and political participation after the peace process? Experience from other countries’ transitions out of armed conflict shows that decommissioned soldiers who are not well trained for a new career or supported sufficiently during their transition are more likely to rejoin armed militancy. The persistence of of paramilitary groups in Colombia suggests that some former fighters of the Colombian armed conflict may not be ready to lay down arms. And, to date, there has been dangerously little attention paid to providing psychological support for ex-FARC fighters (and, more broadly, to the general mental health issues that arise in post-conflict nations). The end of one of the longest-standing guerrilla insurgencies in contemporary world history does not mean the end of armed violence in Colombia. And as the FARC prepares to reconstitute itself as a political party, all potential spoilers to the peace process – both outside of FARC’s control and those well within its mandate – must be soundly considered.